Jin Cho is a sculptural #Artist who graduated from the Sung Shin Women’s University in South Korea and now resides in New York, USA, where she has exhibited in several galleries. Jin has experienced being a curator at agallery, and she has proudly exhibited her own artwork at the various fairs and shows such as the Affordable #Art Fair in Chelsea, the Community Art Project, the Aqua Art Fair in Miami and the Contemporary Art Show in Hong Kong, among others. Jin is most well-known for her distinctive mixed-media style which blends materials and typically features engraved clay on wood. These creationsare meant to convey the complexity of people’s lives and the roads that they travel. 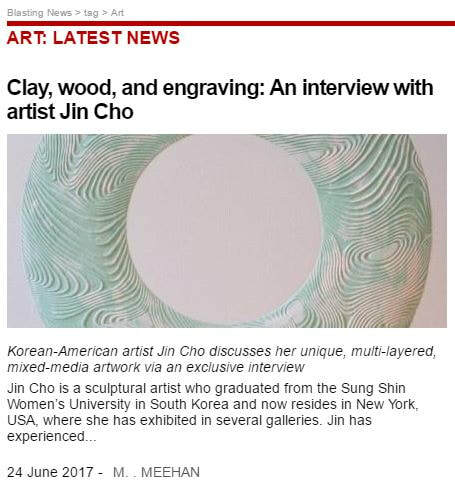 Jin Cho recently granted an exclusive #Interview where she discussed her work and her experiences as an immigrant. Meagan Meehan (MM): What prompted you to study art and become a professional creator? Jin Cho (JC): From what I remember, back in the days during my childhood years, most of the time I was drawing and crafting using my mom’s empty cosmetic containers or yogurt container rather than playing at the playground. For me, art was not a subject of study but a way to play. I liked reading art books of the masters and imagining stories from them rather than reading children’s art books. I believed there might becreative treasure inside the illustrations of the master’s art books, which I could not find a simple illustration in children’s books. My dad used to take me to ballet concerts or to operas, and those were beautiful. I could have learned colors and lights naturally from the stage and performing arts, and that led me to study sculpture. After graduation, I moved to California and studied curating at a gallery and, during that time, I learned that the audience, artist, and her artworks are all important. The audience became an important factor in my work which made me want to study art techniques. MM: What gave you the idea to blend sculpture on canvas and what mediums do you use most? JC: When I was in college, I used traditional materials like stones and wood. I liked how the stone and wood changes its shape and becomes a piece of artwork whenever I touch them, but sculpting stones in the city were different from what I intended to do because of space restriction. At this time, I got inspired by an audience, and I started to study hanging sculpture. When I hung my sculpture on the wall, the sculpture became a picture. I make dough out of stone powder and then attach the dough on canvas. After that, I start to curve and make the surface like a marble and then I design a pattern and hand carving of little pieces. Natural light creates the color of sculptures, or I add dye into a paste and mix it. I like the random, unpredictable color from this. MM: Many of your works are circular and represent the paths that people take in life, so how did you think of incorporating these concepts into your artwork? JC: It is hard to sculpt a solid stone. The living is not easy as well but there is value to being an artist, and it is pleasing. My work is 'how I live in this world,' hardships laid in front of me. We are breaking our fears and walking forward to an unpredictable future. I carve stones; I live on with my life with a sculpture knife. Likewise, in the sculpted path of life, you are not able to find the beginning and the end. When you look at my artwork, you’ll see many lines, and each line represents the life of an individual.When you follow a line, you’ll return back to the starting point. This is a concept of a rebirth; the pure spirit is coming back with a different physical body and these lines from a systematic circulation. No single line overlaps with other lines since one cannot live the lives of others. Fundamentally, each life is an assembly of one big picture. MM: How did you initially get your art seen by artistic organizations, the public, and galleries? JC: I’ve met many artists and have seen their artwork when I was studying curating at a California gallery. I exhibited my pieces there as well and, since then, my works have become known, and I could have opened my own exhibition. After that, I joined art projects and art fairs. I studied curating with Dong Hee at the gallery, and she understands my artwork better than anyone else. I also keep in touch with artists who did their exhibitions at the gallery. We share thoughts and feedback about our work. We recently had a big show together at the Demouzy Gallery in New York, and I was happy to be included in the exhibition with them. MM: What do you think are the greatest differences between the art scene in Korea and the American one? JC: I went to art school in South Korea, and I studied curating at an art gallery in America. I’ve experienced the art scenes of these two countries and the biggest difference is audience because the audience in South Korea is mostly art-related people…even though there are many exhibitions and art fairs that are open to general public. In America, anyone can be interested in art! The very first person who bought my artwork in America was a retired old man who lives nearby! In Korea, the first buyer was my cousin. I would say that the range of the audience demographic is a big difference. MM: What are the most rewarding aspects working as a professional artist and what are your most substantial goals for the future? JC: The power of an artist is that their little gestures could be influential to other people. My artwork could be comforting to someone who is lonely and tired of life, and I think that is fantastic. If I can’t comfort them with a warm hug, at least I can warm their heart with my artwork. I hope I have more opportunities to meet people and share my work with a larger audience. I hope one day my sculptures will be displayed in a public place like in a playground or near a park bench where people can rest. MM: What other exciting events, projects, or occasions are coming up for you soon? JC: Beyond the scope of hanging sculpture, I am planning on sculpting a whole wall akin to a wall painting. I will also keep trying to combine other fields of work with art. This coming September, I will be having an invitation exhibition and presentation at the Korean Cultural Center in Washington D.C., and I’m looking forward to it, and it will certainly be a highlight of my career.